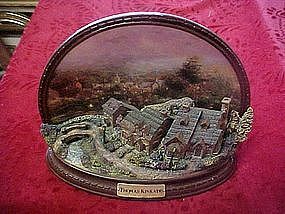 Very cool cork diorama with black laquer frame. Scerne is of a cliffside pagoda, trees and two white cranes. 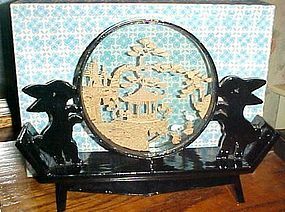 The black laquer frame features two rabbits ( one on each side) of the diorama. Maybe for those born in the year of the rabbit. Diorama is1 1/4" thick with a diameter of 6". Total length is 11" and it is 8 3/8" tall. Perfect condition as it was the day it was purchased. No loose pieces or anything. It has been kept in its original box, which comes with it. 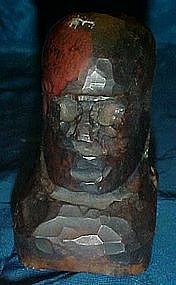 This is a crudely made bust of a totem style head. Measures 3 3/4" tall ans solid bronze, weighing over 3 lbs. You can see hamer marks, chisel marks and where the metal was lopped from the top of his head and not finished. An interesting piece.